A mother’s work is never done, but not all mothers approach the job of parenting the same. Depending on your personality, you will prioritize the lessons you must teach your child to become a successful and happy adult differently. 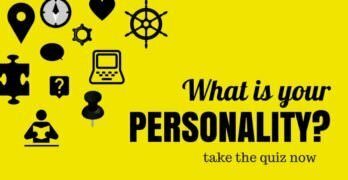 In case you were wondering, there is a personality test out there to help you do just that. 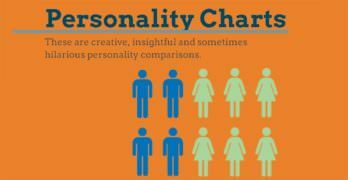 It is called the Myers-Briggs Type Indicator (MBTI), and it is chock full of insights. The Myers-Briggs can be splits into four groups of pairs based on different opposing traits. These traits include introversion or extroversion, sensing or intuition, thinking or feeling, and perceiving or judging. Through these four pairs, the MBTI assigns your personality in one of 16 different combinations. While not absolute, these different qualities can help you better understand yourself and your parenting style. The first pair can be understood as your attitude towards the world. We are not talking about the kind of attitude your child gets when denied a sugary afternoon snack. This attitude relates to how you feel about other people. Introverts will have a tendency to covet time spent by oneself. These kind of moms will understand if their child does not necessarily want to go out and play with the other neighborhood kids and will encourage them to develop a strong sense of self. Extroverted moms will not necessarily want their children to ignore their sense of self, but they will definitely believe their children should have a healthy social life. These moms may be likely to host kids at their own home, have sleepovers, or set-up playdates. They understand that children are often under immense peer-pressure by the other kids their age and want them to feel comfortable and succeed in social situations. The next pair of qualities refers more to how a mom seeks information. What source does a mother use to then make decisions about how to raise her child? We have already about “mother’s intuition,” but in the Myers-Briggs, this takes on a whole new meaning. Intuitive moms trust their gut more and have a tendency to make decisions on a hunch. These moms may not necessarily have a specific reason for not trusting that other kid down the street, but she has a fleeing which tells her not to let her own child play with him. Sensing moms will have a tendency to rely on what she can see or hear. She may not trust that same kid down the street, but she will have an empirical reason to not do so. Maybe she heard the child use foul language, or perhaps she saw him bully another kid. Regardless the reason, sensing moms will require evidence to make a decision, and will often wait or give the benefit of the doubt until sufficient evidence has been provided. Feeling and thinking are the next pair, but this is not to insinuate that moms only do one or the other. Mothers love their children with all of their heart, but they also have to make smart decision on how to raise them. However, feeling mothers with place prime importance on the feelings of not just their own children, but the other people affected by their parenting decisions as well. These moms will take into account how her child’s friends will feel, how the father will feel, and maybe even how their children’s friends’ parents will feel. Thinking moms on the other hand may not ignore the feelings of others, but when faced with making a decision about to raise their own children, other people’s feelings are less important. Even if their child throws a temper tantrum, a thinking mother still makes the decision she reasons as the best and often cannot be swayed by the feelings of other people. She relies on logic to make rational decisions about how to raise her child. Finally, we come to judging and perceiving. This focuses on how mothers deal with the complexity of life. Are they strict and orderly or are they more comfortable going with the flow and adapting to situations as they emerge? A judging mom is not an overly judgmental mom. This kind of mother values structure as a way of providing stability in her child’s life and enforcing a habit of routine behavior. These moms are likely to have a list of chores on the refrigerator or a whiteboard for her child to complete every week. Conversely, perceiving moms are far more comfortable in the chaos that often accompanies natural child-like behavior. That mom who is at peace at Chuck-E-Cheese’s while a throng of children run in every direction is likely a perceiving mom. These mothers thrive in chaos and often seek to expose their children to as many different experiences as they can. This mom can also adapt to plans that change at a moment’s notice without batting an eyelash. 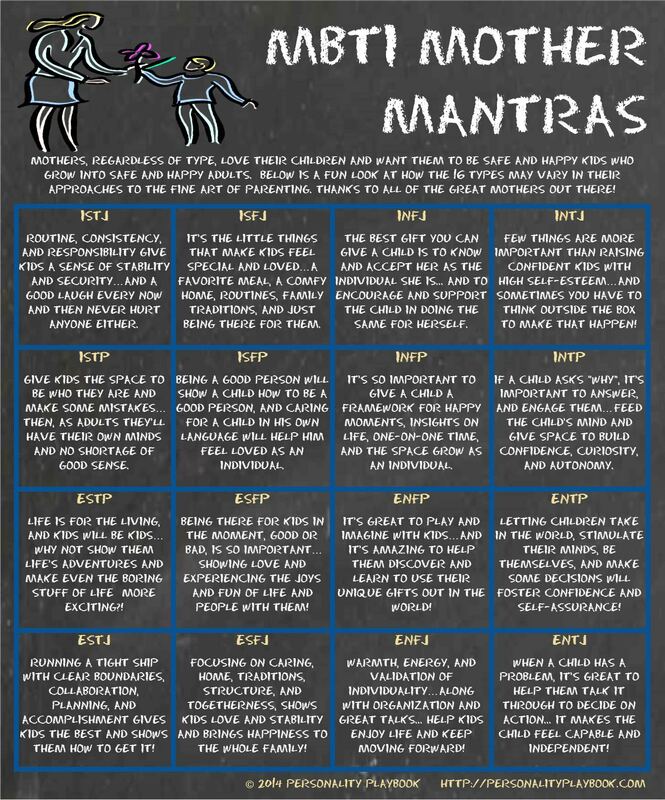 So, after figuring out where of the Myers-Briggs you fall, which mantra do you follow?